The flurry of favors the president did for Bibi could constrain US policy—and hurt people in the region—for a long time. For Israelis, the questions had been hovering for months. Would the right-wing Prime Minister Benjamin Netanyahu claim victory and a fifth term, moving his far-right Likud government coalition even further right? Or would the supposedly “centrist” challenger, former army chief of staff Gen. Benny Gantz, ride to victory amid corruption allegations against Netanyahu? Netanyahu faces three—and potentially as many as five—separate indictments for various scandals. If his Likud party forms the new government, which now seems likely, will it pass a new law prohibiting the indictment of a sitting prime minister? Those questions remain central to Israeli political discussion. But among Palestinians, there was little need to ask about what the election meant for them: Whatever government emerged seemed guaranteed to maintain current Israeli positions in support of occupation and apartheid, against international law, for war with Iran, for full-throated alliance with the US president and US military aid, and against human rights for Palestinians and equality for all. During the campaign, Netanyahu not only vowed to annex illegal Israeli West Bank settlements in violation of international law, but also expressly disavowed the State of Israel’s obligations to its Palestinian citizens. Yet his challenger Gantz was little better, running ads bragging about how many Palestinians he’d killed bombing Gaza “back to the stone age” while commanding Israel’s 2014 military assault. Whatever the specific composition of the new government taking power in coming weeks, the horrific conditions of Palestinian life will remain. While Netanyahu’s political career may have survived an anxious moment, the system of occupation and apartheid he has overseen for decades was never in any danger. And that, it should be said, is fine by President Trump. It’s been clear for a while that Netanyahu’s power is thoroughly bound up with his up-close-and-personal alliance with the US president. Trump’s list of gifts to Netanyahu goes back a long time. First was the unilateral US withdrawal from the Iran nuclear deal, a longstanding Israeli demand, despite the unanimous agreement of US intelligence agencies that Iran remained in compliance with the agreement’s terms. Next began the leaks of what Trump’s “peace plan” (orchestrated by his settlement-financing son-in-law Jared Kushner) would look like—a list of harsh conditions imposed on the Palestinians with no Israeli concessions required. Then came the US recognition of occupied Jerusalem as the “unified” capital of Israel and moving the US embassy to Jerusalem, violating in one fell swoop international law, UN Security Council resolutions that Washington itself had signed, and decades of US and international diplomacy. Next came Trump’s embrace of Israel’s new “nation-state” Basic Law, which raises the legal status of Israel’s apartheid by decreeing that only Jews have the right of self-determination in the country. Trump also ended longstanding US support for the UN agency providing basic assistance to stateless Palestinian refugees—and used the occasion to announce Washington’s position that virtually none of the 5 million Palestinian refugees registered with the United Nations actually are refugees at all, and therefore have no rights that Israel must recognize. More recently, Trump recognized Israeli authority in the Syrian Golan Heights, illegally occupied by Israel since 1967. And that was all on top of the ongoing US support for Israel and Netanyahu, including the $3.8 billion a year in US tax dollars sent directly to the Israeli military; the unfailing protection of Israel in the United Nations, ensuring that no Israeli political or military officials are ever held accountable for potential war crimes; and the efforts to criminalize nonviolent boycott campaigns aimed at ending Israel’s violations of human rights. Those go on all the time. But Trump’s embrace of Israel has escalated the already-supportive relationship far beyond any of those earlier assumptions. The whole run-up to the election was a tour de force of US enabling of Netanyahu’s reelection and the rise and consolidation of Israel’s far-right wing. Finally, given Trump’s embrace of all things Israel, it’s perhaps unsurprising that his personal anti-Semitism passes by without a hint of pushback. He has directly—and explicitly—invoked the exact same anti-Semitic tropes that he and so many others falsely attributed to Representative Ilhan Omar. Speaking to the right-wing Republican Jewish Coalition two days before the Israeli election, Trump directly suggested that Jews harbor secret dual allegiances. 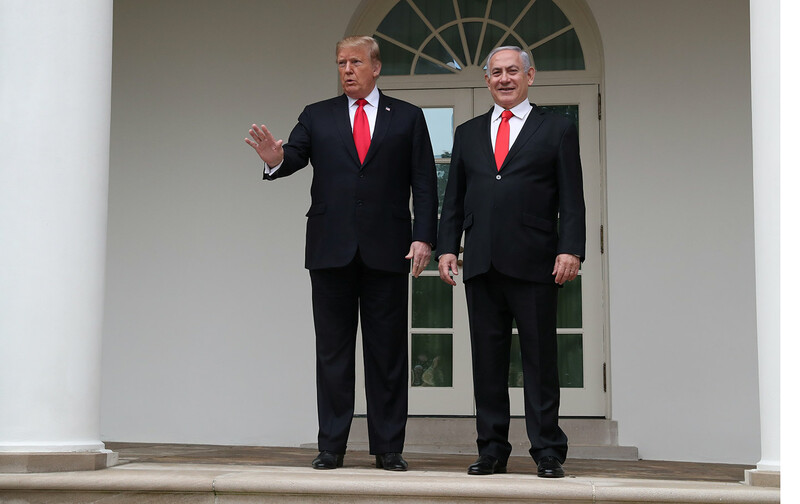 Bragging about his grant of legitimacy to Israel’s occupation of Syrian territory, Trump said, “I stood with your prime minister at the White House to recognize Israeli sovereignty over the Golan Heights” (emphasis added). None of the American Jews in the room called out Trump on his assumption that they viewed Israel’s leader as “their” prime minister, and few in the mainstream press raised a hint of concern about the anti-Semitism inherent in the remark. The president was bragging about violating international law and overturning decades of US policy in order to keep his donors happy. Yet this unequivocal anti-Semitism didn’t lead to calls for his removal from office, even as Representative Omar was dragged over the coals for daring to suggest that money in politics played a role in US political support for Israel. Hypocrisy aside, the consequences of Trump’s actions could be severe and longlasting. Public discourse around Israel has shifted dramatically in recent years, with people across the country—especially the progressives now making their presence known in Washington—expressing far more criticism of the Israeli government’s actions and US support for them, and far more support for Palestinian rights. Yet even with these shifts, some of these recent actions will be extraordinarily difficult to undo. How long will it take before a future US president decides it’s finally politically viable to announce that Iran’s IRGC is not to be considered a terrorist organization? That Israel’s occupation of the Golan Heights really is in violation of international law? That Jerusalem does not belong solely to Jews and that the US embassy needs to be moved back to Tel Aviv? Criticism of Israel is no longer political suicide. But any future president would still have to expend far more political capital to reverse these damaging changes. American-controlled “peace processes” have failed in Israel-Palestine for more than a quarter of a century, but Trump’s actions will prevent the United States from playing any potentially benign diplomatic role in the near future. And they’ll significantly raise the threat of a US war with Iran for a long time to come. Is Netanyahu worth all that?